It's about a depressed man who lives a drab life, and is diagnosed with a fatal disorder. So he volunteers to be thrown into the volcano to save a tribe. But what happens is that his life soon become exciting and he begins to have a reason to live. 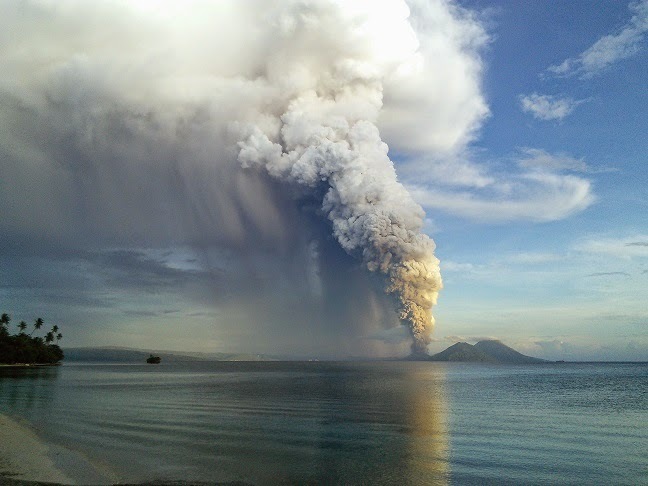 The picture above is the Rabaul volcano in Papua New Guinea, it has erupted today. I've been there. I've been there while the volcano was erupting. In this pic you see the ash raining down. I went there to dub the Luke Video for the Uramet speaking Baining people of the Kokopo region. Thankfully, this was pretty much my view of any eruptions. It is funny what you get used to. This sentence was uttered more than once while I was there "well we should be able to fly out if the volcano isn't erupting again." The practical effect of a repeatedly erupting volcano was simply that the planes couldn't see to land safely. When life involves sentences like that, when the eruption of a volcano becomes a commonplace annoyance, then your life has enough adventure and you've no risk of becoming like Joe. people who share the same home as they do. Which is why the idea of home for me is a bit of a prickly pear. knowing some of the non-American traditions I enjoy. (Like Boxing Day). as much as I care what God thinks of me. and approve what God's will is—his good, pleasing and perfect will. we're still living with a foot in the U.S. and a foot in PNG. the temptation to get too comfortable. It makes living out that Romans 12:2 verse so much easier. there to make an impact. nothing but a temporary visitor there. to this earth, bring a lot of comfort. One of the many purposes of furlough is to get caught up on our medical needs, but it can be very costly to find a new family practitioner (our old one has since retired) and pay the co-pay for a visit, get them our medical information, then get a prescription, etc. Our doctors at the clinic in PNG are very helpful and awesome. Knowing we’d be traveling a lot, they decided to help us out by giving Kendal a prescription for her meds that she could fill once we landed in CA rather than spend the time trying to get into a doctor’s office. lost another day, tried again, nothing. Finally we wrote an email to our Doctor in PNG, who then made a SKYPE call to the pharmacy, and within 30 minutes we had our meds! Our doctors in PNG are awesome! They’re not only skilled, available, affordable, and personally care about our family and intimately known our medical needs, but they’re also willing to go the extra mile and make a call on a weekend for us. They work long hours, and hard, and during the quiet rare moments of rest they do get, they made a call for us, and rescued us from Pharmacy Phrustration. Feeling a little sheepish today. I’m realizing that there is some technology that exists in the U.S. that I haven’t seen in PNG yet. 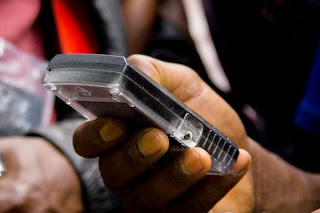 Earlier in the week I was trying to remember a solution we used in PNG called ‘Bomgar’, and for the life of me I couldn’t remember the name of this technology I had used for years. That’s when it hit me. Chad, your brain is 40 years old, and you’re trying to absorb a lot of new information, this is where the metal meets the road, you have to prove you can rise above and make your brain work! I hear something frequently in my line of work. "I could never do what you're doing, give all of my comforts up and move overseas! Wow"
"Yes you could, you just don't know it yet." God put the yearning in us to do the thing, and then also put in us the ability to overcome the hardship that came with the decision to move overseas. Today in my Bible reading I came across something I had just let slip by before. "Demas has deserted me because he loves the things of this life…." Paul wrote that a friend/co-worker of his had deserted him, because of a love for 'this present age' or 'things of this life'. So I had to dig into it a bit more. I read several commentaries, and even a few sermons that go on about this. Note 3 at 2Ti 4:10: Demas is only mentioned three times in Scripture (Col 4:14, this verse, and Phm 24). In Phm 24, Paul called Demas his "fellowlabourer." In Col 4:14, Paul sent greetings from Demas to the Colossians. Here, he mentioned that Demas had forsaken him. Paul gave the reason for Demas forsaking him as "having loved this present world." It wasn't easy being in ministry with the Apostle Paul. Paul had been in prison for a long time. He spent over two years in prison in Israel after his arrest in Jerusalem, before he departed for Rome (Ac 24:27). His trip to Rome included a shipwreck and being stranded on an island, all of which surely took a year. He then remained in prison in Rome for two years (Ac 28:30). Most ministers today would have left with Demas. They would think it unreasonable for anyone to have to put up with such hardship. They certainly wouldn't have found fault with anyone who left under such circumstances. They would have been sympathetic, but Paul's evaluation of the situation was that Demas left because he "loved this present world." Jesus preached a hard message: if those who started following Him looked back longingly at what they had left, they weren't fit to be disciples (Lu 9:59-62). Jesus also said people had to relatively hate every other relationship and their own lives to be His disciples (Lu 14:26-33). He said, "No servant can serve two masters" (Lu 16:13). Therefore, Jesus and Paul agreed on the level of commitment necessary to be a disciple. Our modern-day evangelistic approach to the Gospel doesn't make many, if any, demands on people, but the saving faith that the Bible promotes demands commitment. We would do well to preach the level of commitment that Jesus and Paul preached, instead of conforming to the lower standards of today. Would you agree with that? Jesus did preach a hard message, we are told that Christians will be persecuted. When I became a believer at the age of 5, I knew then that it was not a formula for happiness and success. I knew then that Christians faced a hard life. Of course at 5 it was put to me in a much more simple fashion, but I got the gist. Following Christ means I am very likely to experience hardship in my life. So what do we think about using the little documented life of Demas as a way to prove the point that modern day evangelism should be harsher? 1 - there is better evidence in Scripture to base this message on. Perhaps using Demas is a bit of a reach…. but I don't disagree with the message. 2 - I think the message of the Gospel of Christ is a compelling one when told with strength. I think that we need to avoid the temptation to water down the Gospel to make it seem more attractive. I think that actually telling it in its full accuracy, being as harsh as it is, makes it much more appealing because: a) it's true and b) people are not afraid of a challenge. Christians will be persecute, have been, and ARE being right now! You could be thrown in jail for life, beheaded, shot, tortured, called to live in an uncomfortable place. You will face angry people, have to go to remote locations, maybe even face a little adventure and trials. Your value system will be the opposite of what the world's is, and you will start to see the walls closing in all around you as this world gives itself over more and more to sinfulness. There is sin, there is a hell, but there is salvation and there is a God and He is good and loves you and cares about you individually and personally. But in the end, your faith will have been strengthened and proven and you will have become one of those people who you said "I could never do that." You can because you have Christ, and according to Matthew 19:26, Mark 9:23, Mark 10:27, Luke 1:37, Luke 18:27, Matthew 17:20, Gen 11:6, (and the list goes on and on)…. We've been in Oregon for about 11 days. In 4 days we head back to California. We move into our 'next' (not new) place. 12 days after that we go to Arkansas for a family gathering to spread the ashes of my father-in-law. 5 days after that we head to Florida for some training and to visit friends. During this time we've done a few things, seen a few people, did some work. - Yes, the plan is that we are still going back to PNG. July 2015 is our estimated departure month. Q. Do we still need support while on furlough? Q. Do you need to raise support to return to PNG? -Yes. We need to raise more financial support before departing for PNG. We're still visiting and settling and aren't quite ready to begin public speaking but if you have ideas for us, please let us know! Some of you may remember the story of me trying to find a barber on our last furlough. Long story short, I spent an hour getting my hair cut by a bourbon soaked Vietnam vet. Today I ventured out for the first time to get my hair cut in the U.S. after 4 years. I figured, it couldn't happen again… right? I am in Oregon, and I just happened upon the nearest, nice looking barbershop, plunked down and began the cut. Not long before I smelled the alcohol on the breath of my barber, he started asking me about things, and when I was only giving him one word replies, he began in on his Vietnam war stories. I have the utmost respect for Veterans but as he was speaking I was thinking 'what are the odds I got another drunk vietnam vet barber in a completely different state after 4 years?" He told me about his PSTD, seeing things you can't unsee, passing out on the 4th of July, etc etc…. all the while buzz buzz snip snip. I ended up with a not great, not horrible hair cut. The cynical thought hit me 'maybe there is a line of thinking in the Barber world that to get better tips you can pretend to be a vietnam vet' So I probed a bit. etc etc.. so he appeared to be the real deal. News flash… if you want a nice tip, give me a nice haircut, don't regale me with horror stories that may or may not be true. I wonder if the other guys were snickering the moment I left. I don't know. Maybe I'm still acclimating to the culture but I seem to have a real problem trusting strangers. I never used to have that problem, but I feel like a lot of people are selfish and out to rip you off unless they know and love you. Kudos to Chris Tapp in PNG who has given me the best haircuts I've received in years…. and for not being a drunken vet. The reason I keep going on about Audibibles is because it is the main thing I do in PNG. "The Audibible goes where we cannot," explained SIL translation advisor Rich Mattocks, speaking of the hand-held, solar powered audio player. "These are excellent in Papua New Guinea where many areas do not have electricity." Rich and the team of translators recently completed the translation of the Kamano-Kafe New Testament. Although the written form is still at the printers, the audio recording is available on the Audibible and is already making an impact. The team is now forging ahead with the translation of the Old Testament. One day one of the translators, James, received a message that his elderly Aunt Benifitio had died and he asked to be excused from the translation work to visit his extended family during the days of mourning. Months before her death, his aunt bought an Audibible. Bedridden, Benifitio asked others to take the Audibible outside each day to be charged in the sun, but she warned them not to carry it away from her house. As friends and family stopped by to visit her in the evenings, Benifitio's Audibible was playing. When her younger brother Marco* came and listened to the Scriptures, he accepted Christ and his life was changed. Many others also heard the Word of God spoken in their heart language on Benifitio's Audibible. When James arrived for the days of mourning, the family welcomed him and asked, "What have you been doing?" When he answered, "I've been translating the Kamano-Kafe scriptures," Marco's face brightened and he said to James, "Thank you for turning God's talk into our language. The Kamano-Kafe language is very sweet and I understand it. I quit going to church because the message didn't make sense to me in the trade language or when pastors used English. But when I heard God's talk being spoken in our own language on the Audibible I understood it and now I believe in Jesus." After the time of mourning was completed, James returned to the translation table, more convinced than ever of the need to get God's Word to people in written and audio form in the language they understand best.